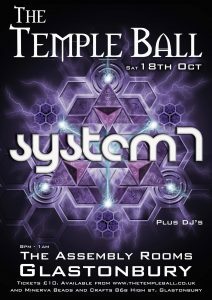 Come and join us to celebrate our 3rd Birthday with very special guests; System 7 and dance the night away in our UV geometric temple created by Art of Sacred Geometry. We are also pulling out the stops and bringing you a fantastic line up playing you the very best in progressive psy to feast your ears on. JimJam Temple Ball resident JimJam has been DJ’ing for 12 yrs now playing all over the country at free parties with Fushion sound system and is also co founder of the Awakening club nights that started in Manchester and ended up in Reading. His style is described as driving progressive psy played in a full-on style. Gazillion (aka Chillion) Temple ball resident Gazillion has been Dj’ing for too many years now he has lost count. He is known for his chill-out sets (as Chillion) at many of the UK electronic festivals over the years. But as Gazillion he will be providing a mid evening bouncing and funky, deep and groovy melodic progressive sound. Barbara Psystrand (aka Showsey Manza) Up and coming DJ and part time resident for the temple Ball Barbara plays many styles from the Psy genre, psy dub, psy chill, full-on and progressive. With his eclectic taste in psy he always get the Ball started with a swing. Sound by Fushion The hand built rig, by master sound engineer Julz from designs by Turbo sound systems, is truly a sonic embrace that your ears and body will thank you for! Lighting by Dooza & Gloworm You’ve got to have flashy lights, and these guys have an array of subtle movement, whirling dervishes, lasers and luminance that enhance the experience to the max – all through the magic of dmx! Posted in Dooza, Dooza Lighting, Gigs and tagged The Temple Ball.